LIve has changed a lot since version 1 (right), but its core design features remain the same. Introduced less than a decade ago, Ableton Live has quickly established itself as a big hitter thanks to its unique approach. In this article, we'll be looking at the short but eventful history of Live, and we'll also investigate what makes it so different to other DAWs. Live's unique selling points make it a seriously attractive package for electronic music producers, so we'll check out just what makes it stand out from the crowd. From the very beginning, Live threw out the rulebook on how music software should work. Initially launched as a relatively simple loop arrangement tool, Live quickly expanded to become a complete DAW, MIDI sequencer and VST host. Other DAWs, such as Logic and Cubase, began as MIDI sequencing packages then added digital audio and mixing features to become all-in-one music recording and production packages. Pro Tools came at things from the opposite direction, focusing on multi-track recording first and foremost then building a MIDI and mixing environment around it. Live is a much younger product, designed from the ground up without any legacy features or restrictions to limit it or force it down a particular route. Live arrived on the scene in 2001, the first product from Berlin-based software developer Ableton. Developed by Bernt Roggendorf and Gerhard Behles - then a member of Techno act Monolake - Live was intended as a performance tool just as much as it was a studio one. Despite Live's excellent audio capabilities, the clever user interface and workflow were some of the most striking features of the program when it launched. Crucially, Live uses two main views to manage the production, composition and performance features: Session View offers mixer functions and a grid-based representation of all the clips (audio loops and samples) in your Live Set, while Arrange View uses a more traditional horizontal timeline, allowing arrangements to be pieced together from clips. The approach was an immediate hit, winning over producers of all electronic genres. Newcomers to Live might be surprised to look back at version one and see just how far the software's come in the course of ten years. Live 1 offered absolutely no MIDI sequencing features, focusing solely on audio with the emphasis on loops and manipulation of samples. The live performance bias and the focus on electronic music meant that the workflow was significantly more hands-on and intuitive for dance producers than a traditional DAW. Triggering loops, playing samples and creating arrangements was made easy thanks to exceptional implementation of real-time audio timestretching features, but whether you could really have called Live a DAW at the time is debatable. The program was capable of hosting VST plug-ins for effects, but the lack of MIDI sequencing meant that VST instruments were not supported. Even so, as a sample arrangement tool or DJing package, Live was highly capable. Versions two and three, released late in 2002 and 2003 respectively, fine-tuned the formula without making radical changes. With the release of version 4, though, Ableton Live really came of age. Released in the summer of 2004, Live 4 was the biggest overhaul of the program since its introduction. Without doubt, the most exciting new feature was the introduction of MIDI sequencing. For the first time, Live users could work with virtual instruments (VST for Windows, VST and AU for Mac) and record and edit MIDI note information. Live's own built-in instruments offered two alternative takes on sampler plug-ins: Impulse (an eight-part drum sampler) and Simpler (a basic but effective melodic sampler). Live's MIDI functions also allowed the introduction of MIDI effect devices. Drag a MIDI effect to the signal chain before the instrument and the incoming note information can be manipulated in real-time. Similar effects can be achieved in most DAWs, but it has to be said that Live's implementation makes MIDI processing a lot easier than others. The next few years saw Live steadily develop and improve. 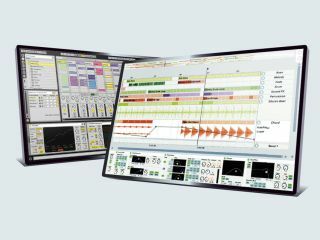 Practically every year brought the announcement of a subtly upgraded version with more devices and unique features like Racks for storing multi-device instrument and effect settings. 2010 also saw the arrival of Max for Live, an incredibly versatile production toolkit which bridges the gap between Live and Max/MSP. In fact, the link between Live and Max goes back quite a while - although rumours of Live originally being developed in Max are unfounded, most of the devices were prototyped in Max at some stage. Live opens up a variety of workflow options. The software isn't just about the features on offer but also about how you use them. In addition to using it as a DAW in its own right, we've seen people using Live in all sorts of ways: some producers use the ReWire protocol to integrate it with another DAW, some use Live for pre-production, playing with loops and samples before moving to another DAW to put together arrangements, others compose in Live then bounce tracks, export MIDI patterns and mix in another DAW. This isn't to say that Live isn't a perfectly capable package in its own right, but if you're more familiar with another program such as Logic or Cubase it might make sense to use Live for its exceptional composition features but stick with what you know for mixing. In addition to its software features, one of Live's major selling points is its seamless integration with a variety of hardware controllers that are designed to improve workflow. The two main choices are Novation's Launchpad and Akai's APC40. These and other unofficial third-party controllers offer clip launching functions, mix options, note input and DJ features to suit most users. More recently, iPhone and iPad controllers such as touchAble and Liine's Griid offer similar functions to hardware controllers but take advantage of the Apple hardware's excellent touchscreens - perfect for Live users on the move. At this stage, it's probably worth taking a closer look at Live's warping features. Timestretching audio (adjusting the tempo of a digital recording without affecting its pitch) is by no means a new idea, but the way Live handled it was pretty revolutionary at the time. For most of us, warping is all about matching the tempo of loops, samples and other elements of an arrangement. Once the tempo and warp points (beat markers) of an audio clip have been identified, Live's timestretching algorithms make it possible to carry out real-time synchronisation of tempo, quantise beats or apply swing. The results will sound subtly different depending on the selected warp mode, each of which offers an algorithm more suited to particular source material. Individual clips can use different warp modes to ensure the best results, so it's worth experimenting to see what works best for each clip. The more basic Beats, Tones, Textures and Re-Pitch modes each have their strengths for particular source material, while Complex and Complex Pro modes are generally the best all-round compromise. As the name suggests, Live is a great performance tool for anyone interested in taking their music out in front of a crowd. The software is also massively popular with DJs thanks to its seriously advanced mixing and beatmatching features. Whether you're mixing original material or other people's records, it's a case of preparing a set and triggering clips and scenes as you go. For DJs, Live's automatic tempo analysis feature does a basic job of guessing the speed of tracks but it'll rarely be perfect so a bit of work is usually required to fine tune everything. DJs and live performers alike can take advantage of the creative options Live has to offer: seamlessly blend from one track into another, create mashups by mixing parts of different tracks together, remix tracks in real time, add MIDI parts, samples or effects to audio, resample the mix output and bring it back into Live and so on. Critics might say that working in Live takes some of the skill out of DJing but it seems foolish to dismiss it on that basis. If it makes life easier and can be used to create great mixes then what's the problem? Besides, anyone who's seen a really good Ableton DJ will know that there's a lot more to it than just sitting back and letting the software do the work for you. Like pretty much all modern DAWs, you can take your pick from a variety of Live packages. For beginners, Live Intro (€99 download, €129 boxed) and Live Lite (included in some hardware bundles) offer functional but stripped down versions of the basic Live program. The regular Ableton Live 8 package (€349 download, €449 boxed with Essential Instrument Collection 2 samples) includes the program itself plus a good selection of instruments and effects, but if you want absolutely everything, Ableton Suite (€549 download, €699 boxed) includes the full package. Free demos are also available to download from Ableton so there's no reason not to give Live a try.